How to take care of a horse, horse care tips on habitat, horse feeding and grooming, and horse behaviors. Information about light horse breeds, backgrounds and history of hot-blooded and warmblood light horses with horse class, equestrian discipline, and horse training by body types: stock type, hunter type, saddle type and others. I just lost my Arab two weeks ago. He was 27 1/2. My best friend for over 26 years. By far the smartest horse I have ever met. Rode him two weeks before I had to put him down due to colic. Miss him so much. At 59 I thought that I may not get another horse but have started looking for another Arabian. I have a 16.3 ottb but want another small go to guy like my old Traveller. Billy Appaloosa gelding for sale £1000 He is a lovely natured 13.1 pony he is 9years old,I have had billy for a year and to be honest it’s a sad sale due to not enough time and my experience not being my strong point.Selling due to lack of time to reach her full potential. I would like billy to go to a loving caring experienced home where he is going to get the work and schooling he needs, he hasn’t been in work much in this last year either. He has a fantastic temperament, personality and bags of potential I have a 3year old and he is amazing around her and other children in my family. I am looking to purchase a haflinger gelding for english riding on trails and ocean. Hopefully 15 hands with an age between 6-12. calm disposition of a 1-3 out of ten. Looking for a Bay Gelding to drive with our Black Gelding thank you! I have a 10yo rigistered Pintabian gelding (99.21% Arabian) for sale. Stunningly beautiful black and white shiny coat with a few spots of grey and bay. Asking $3800 US dollars. He is trained and has been shown lightly in hunt seat. However he could go any direction. Serious inquires only please. Located in central Minnesota, USA. Though not the oldest breed of horse, the Friesian is thought to be descended from the primitive Forest Horse! 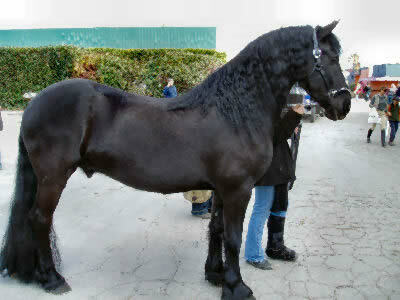 The picturesque Friesian is known for its flashy movement, beautiful black coat, and thick mane and tail. It is a popular carriage and dressage horse. It derives its name from its county of origin. It was developed in Friesland, which is an island off the coast of the Netherlands. There is evidence that the Friesian horses may have existed as far back as 1000 BC. It is thought that it may have descended from the primitive Forest Horse. The Roman historian Tacitus, in 55-120 AD, noted it as a powerful and versatile horse. The Friesian carried both Friesian and German knights during the crusades. That brought it into contact with Eastern horses which lightened the breed. It was further improved with Andalucian and Barb influences while Friesland was under Spanish control in the 16th and 17th Centuries. Throughout this time it was a popular breed and also influenced the development of many other breeds including the Fell and Dale ponies, the Shire horse, and the Oldenburger. Friesian horses are large in stature, but these high stepping beauties are quite versatile and willing to train. These great all-around horses also have a gentle disposition. They are commonly seen in entertainment shows like circus acts and exhibitions, as well as traditionally being used for horse drawn hearses in England. With the inclusion of the stallion, Othello, in the 1985 film Ladyhawke, they've become popular in the film and entertainment. More recently they have been used in the movie Eragon. The Friesian is a light horse breed. Light horse breeds generally weigh under 1,500 pounds. They are typically used as riding horses for leisure and trail riding. Being agile and swift, many are also used on the racetrack, in the show ring, and for work on the ranch. Light horses are grouped in a couple of different ways, one being the continent or country where they originated from. They are also grouped according to training, classified as either a stock type, hunter type, saddle type, or 'other'. A body type is generally attributed to each class, with the 'other' classification being a bit of an odd ball. It includes those that are color breeds or those that may fit a body type of one of the training classes, but not be used for that type of training. The 'other' types can also include those that may fit into more than one of the type groups. The horse class the Friesian fits into is the 'other' class as there are two distinct conformation types: the classic heavy type and the more modern sport horse type. The Friesian horse was developed in Friesland, a provence in the northern Netherlands, and is thought to be descended from the primitive Forest Horse. Evidence suggests that the Friesian horse may have existed as far back as 1000 BC. In 55-120 AD, the Roman historian Tacitus noted the Friesian horse's existence and found it a powerful and versatile horse. The Friesian has been influential to many other breeds, such as the Fell and Dale ponies, the Shire horse, and the oldenburger in the 17th Century. It was a common mount for Friesian and German knights in the Crusades, and as a result Friesians contact with Eastern horses, which lightened the breed. The breed was further improved by Andalucian and Barb influences that occurred when the Netherlands became under the control of Spain in the 16th and 17th Centuries, adding stamina and better range of movement. Despite its popularity in the 16th and 17th centuries and its influence on other breeds, the Friesian nearly went extinct during the early 20th Century. This was largely due to the popularity of trotting horses and the reduction of horses being used for agricultural work. By 1913, only three Friesian stallions still existed in Friesland, but interestingly the breed was saved by the WWII, when fuel shortages encouraged farmers to return to horse power. A new breeding program was started using imported oldenburger stallions and the breed was revived. Today's Friesians are known for their beautiful black coats and their long, thick manes and tails. They generally have no markings, although they can usually still be registered if they have a small star on their forehead. They have ‘feathering,' or long hair on their lower legs, which is purposely left untrimmed. They can range in height from 14.2 to 17 hands high, but on average they stand about 15 hands high. They are compact and muscular, with a fine head and a thick, arched neck. Today, there are two distinct conformation types: the classic heavy type and the more modern sport horse type. 'Feathers' on their lower legs: To keep their ‘feathers' looking neat and to show off their legs, clip the hair behind the knee and on the front of the cannon bone. You want to keep the hair around the fetlock and below, but trim feathers that drag on the ground too much. To keep the tail looking nice, cut the bottom evenly around the height of the fetlock to keep it from dragging on the ground. Tail: If the tail is not this long, the cut it evenly at the lowest point with enough hair to get the tail to stay thick until the very bottom. Mane: The mane on Friesians is usually left long, but do not cut it along the bottom because it will not be even. It is best to pull the mane, meaning pull out the longest hairs until you get to the desired length. You must do this fairly often to keep it at the desired length. Friesians are incredibly versatile and willing, and although they are large in stature they are known for their elegance and high-stepping gait. This makes them ideal for use as harness horses, creating a powerful, agile, and flashy driving team. They are becoming increasingly popular as dressage horses due to their power, movement, and body control. They are also great all-around horses and have gentle dispositions. Friesians have also become popular in the film and entertainment industry. The breed owes much of its current popularity to the stallion Othello, who appeared in the 1985 film Ladyhawke. Other films that have used Friesian horses include Eragon, The Mask of Zorro, and 300. They are also commonly seen in live entertainment shows such as circus acts and exhibitions. In London, a team of Friesians is still used to pull the Harrods department store carriage for promotional excursions and deliveries. They are also traditionally used in funerals that require horse-drawn hearses in England. Friesians are somewhat prone to a disease called Osteochondritis dissecans (OCD) simply due to their size. OCD is a disease found in young, rapidly growing horses who will mature to be over 15 hands. It occurs when cartilage at the end of growing bones breaks down instead of turning into bone as it should. As a result of the break-down, small pieces of cartilage may break off and harden into bone cysts, causing inflammation and pain in the joint. Treatment includes joint injections and rest, and surgery is possible. Dwarfism is a genetic disorder that can affect any breed and occurs the most in pony breeds, but is present in the Friesian breed. The disorder causes the body to be severely disproportionate and it is debilitating. Friesians are disposed to an infection called scratches, which is scabbing that appears on the back of the pastern and fetlock. It is thought to be caused by standing in wet areas and the ‘feathers' cause the area to stay wet for a longer period of time. It can cause discomfort to the affected horse, but can be easily cleared up by shaving the affected area so that it can dry out and scrubbing with a cleaning solution such as an iodine scrub for several days. Friesians are fairly available in Europe and the United States due to their popularity. They are fairly expensive if they are flashy and have some training. If they are bought as yearlings, they are more reasonable. I bought my daughter a friesian gelding of 4yrs and F2 registered however, how does one go about keeping them black all year round. I cannot find any info regarding this matter on the net. Can someone answer this for me please. Best way to keep your horse black is keep in during the day and turn out during the night.. another alternative is putting on a fly sheet which is light ( won't get too hot etc ). Wash down sweat areas if weather permitting or a quick rinse.. as sweat also lightens the coat. Hope this helps. love him for the horse he is and not what you want him to do for your ego. Let him run and play in the light and avoid over feeding and over supplementing this breed. The most striking coats are seen in the Friesians that the owners have allowed to move freely with companions and plenty of space. When the winter sun comes he will return to his lovely color. It is the sun which causes the coat to turn red, so you can help to keep it black by them wearing a fly sheet with sun protection built in. I hope this helps. You have to keep them in during the day and only let them graze at night. Sun during the summer months are a black horse's enemy. Also use shampoos that are designed for black horses. Hope this helps. Hello, I have owned Friesians all my life and never have I had anything but black. Keep them rugged in winter and summer also (Obviously a lighter rug) shade in the sun and they bleach easy. Once wet rub down with a towel to get most of the wet off. Sun and wet is the problem of changing the coat colour! Hope I helped. Some friesians are jet black naturally, others fade during the summer. If it's that important to you, be sure to buy one that won't fade. The majority do, however, and who cares? It's the health of your horse that matters most. Besides, the judges don't care about fading, so it won't score against you at the keurings. There is an item called black knight, it works wonderfully, expensive but takes all the red and brown out turning your friesian pure black, look it up on the website, you will be happy you did. Hi. Happy new year to everyone here. Just lost my wife and she left behind what she considered her children. I was looking for answers on how to vaccinate horses and i fell on this blog. We have two beautiful friesians. Am of age and so busy with other things so, cant really take care of them. if you are interested, you can contact me on zsanuella@yahoo.es and we talk about you getting them. Not expensive. I have a 15 year old Friesian mare who is showing quite a few grey hairs around her eyes, on her nose where the nose band goes and in her moustache. Is this normal for her age please as I have know much older horses, with no grey hairs. Thanks. I know this is kind of an old post. But Frisia is not an island. There are Frisian Islands, there are probably Frisian horses there, but the Frisian horses have existed long before those islands where even there. Frisia used to be a kingdom that ran all the way from Belgium to the Danish border. The Frisian Horse is a mix between the original Frisian Horse that was used in the North of the Netherlands, a small part of Frisia, for over 3000 years and imported Spanish Warhorses, creating a coldblooded horse that looks like a warmblooded horse. Thanks for the correction! Friesland is a provence in the northern Netherlands, not an island, and we'll get that changed.